I’ve been doing the final tweaks, for now, on speed for BlogAid and I’m very pleased with it!! I’ve identified the theme related issues that are still dragging the speed a little. And I’ll be addressing those in my upcoming theme revamp. It’s all about page weight! There is no magic bullet or plugin that can overcome a bulky site. And finding what’s causing the issues is why you need a site audit. There is low hanging fruit that’s cheap and easy to fix. I have yet to do an audit where I didn’t find something that could easily be swapped to help take the drag off the site. I’m super busy making the new tutorials for my Webmaster Training peeps on the premium version of WP Fastest Cache and WP Rocket. And as soon as those are done, I’ve got a couple of Cloudflare tutorial updates to do. The workshops will be free to Level 6 Webmasters. Yesterday I updated the Cloudflare Page Rule tutorial in Level 4 of the Webmaster Training courses with one setting that all of us need to change, and the setting that caused all that hoohaa with my member sites. It applies to e-comm sites, and any others that require subscribers to log in too. I’ve been running the new combo on BlogAid for over a week and there’s been no disruption to member access, so I know for sure that it works. And boy am I glad to have that hoohaa over! Huge thank you to all the members in the Webmaster Training and DIY SEO courses for your patience as I worked out that issue and now have extreme speed on the main BlogAid site again. If you use the MediaVine ad network, be sure to poke around different pages of your site and scroll down them. As the ads appear and change, keep an eye on your HTTPS status in the URL bar to see if you lose the secure status. There is a setting in your MediaVine plugin to block HTTP ads so you don’t lose that secure status. It’s not working on one of my client’s sites. And we just migrated to a new host, but I can’t find any issues with the code. I asked my site audit clients who are using MediaVine to check their sites and one other was having the issue too. She updated to the latest WordPress and Genesis versions and that fixed it. I’m betting the WP update is what made it work. So, be sure to check your site for that if you are using MediaVine’s plugin. Michigan had a horrible ice storm this weekend and it brought down part of the power grid. Since the A2 of A2 Hosting stands for Ann Arbor, they were affected by it and some servers were down for a couple of hours on Sunday. Their backup generators kept some servers running but some of them failed, including the one that runs the A2 site. And that’s why Star Fleet has a backup system for the backup system. I’m glad they were able to get things running again within 2 hours. I bet the power grid wasn’t back up by then and there were a lot of folks getting pretty chilly. It looks like SiteGround is finally addressing a major issue with their SG Optimizer and Super Cacher settings. For page caching, you can either use it, or the one in your local caching plugin, like WP Fastest Cache or WP Rocket. But you can’t use both. And I’ve always been able to tweak the plugins to make the site run faster than what SiteGround offers. The kicker is, there should be a way to make them work together because you get a LOT of server hosting resource saving benefits by using the caching methods the host offers. But, for that to be truly beneficial, and worth giving up a little speed, you need to have over 25,000 visitors a day. That’s pretty much where the benefits of Litespeed Caching plugins kick in for hosts like A2’s Turbo package, which runs on Litespeed servers too. Most of my clients would rather have the raw speed, so we’ve just been turning off the server side caching stuff at SiteGround. Well, now they have a new filter for the thing in SG Optimizer that disables page caching in local caching plugins. So with this recent change, if they detect that you’re using WP Rocket, then the SG Optimizer lets WP Rocket take the lead with page caching. I can’t wait to try this new combo to see if we can now get the benefit of both. Problem is, I can’t measure the full benefit on my test site, since it gets no traffic. So, all I can see is the raw speed results. But, that is worth checking into. And, perhaps one of my site audit clients that is on SiteGround and has over 25k hits a day will volunteer to have this setup installed and let me monitor the hosting resources. SiteGround and other hosts have switched to PHP 7.1 as the new default for all new hosting accounts. If you’ve already made the jump from older PHP versions up to 7.0, then it’s likely you’ll be fine now at 7.1. And, you may just want to go ahead and give 7.2 a try, but check your site super carefully. Version 7.2 deprecated a lot of functions and some older plugins and themes may break. But, you will get a speed bump in the switch. So, it’s well worth trying for it. And, PHP 7.0 is no longer being actively supported. If you haven’t even made the move up to any version of 7.x yet, you most definitely need to do so pronto. There was a big change late last year in the lastest version of cPanel, which is v68, with regards to how SSL certificates are handled. cPanel has a thing called AutoSSL which is the tool that auto renews your free Let’s Encrypt certificate every 90 days. Actually, it does a check on it every day to see if it needs renewing. The important thing to realize is that you don’t have just one SSL certificate. You have several. One is issued for the domain. And then others are issued for a clump of stuff like cPanel itself, your FTP connections, webmail, and more. Last year I saw that certificates are no longer being issued for some of that other stuff. And all of us have been losing an encrypted connection when we log into things like cPanel, or retrieving our email, if you still have that going through your host. I’m going to continue monitoring this situation because it will cause a security issue. But, there’s nothing for us to do about it right now. I just want you to know because you may start getting emails that something is not right with your SSL certificate now that more hosts like A2 Hosting and SiteGround are switching over to the new cPanel version. Please do not send me an email about it, asking me if this is something you need to have fixed. If you do, I’m going to send you to this Tips Tuesday post. I’m already giving you the info for free. I certainly can’t answer 300 emails for free. It’s up to you to at least take 10 minutes out of your whole week and read Tips Tuesday so you keep up. FYI, that’s the same amount of time it takes you to generate an email to me and read a reply. If you are a site audit client, you’re always welcome to ask questions in our private Facebook group. That way everyone benefits from the answers. If you’re in our group, scan or search it to see if anyone else has already posted the same question. You’ll get an answer faster. And yes, this is something I’ve been keeping my webmasters apprised on for months because we have to stay that far ahead of the curve. If you are using Aweber or Mailchimp for your email list service, then you may have already received notification from them that you don’t have to do anything to be in compliance with the new GDPR European regulations that go into effect in late May. Most all reputable list services auto include a link in the footer for folks to update their subscription or delete it, so it’s probably okay. But do check. The WordPress devs have been working hard on developing a GDPR compliance policy to roll into the core code for how anything on WordPress saves visitor data. Those new policies are scheduled to roll into the core at the end of April. I suspect that will be in the next minor WP release of version 4.9.6. They are calling for folks to help test the latest version. 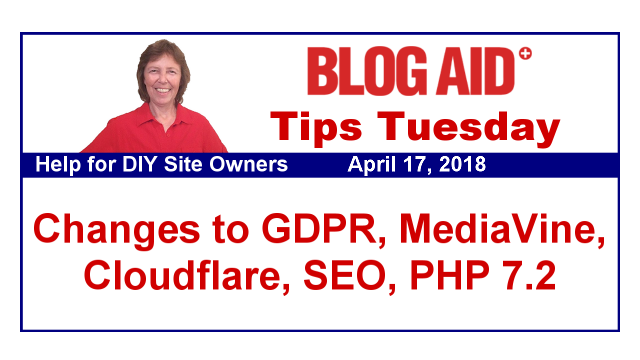 Even if you’re not up for that, it’s well worth you taking a minute to read their latest post and what GDPR is and WordPress’ role in compliance. I read through a post titled Publishers Haven’t Realized Just How Big a Deal GDPR Is. And they suggested that you can’t run ads from 3rd party vendors, or anything from 3rd party vendors that collects/tracks info on visitors without their expressed consent, like an embedded quiz and such. And, I’m scratching my head. Isn’t this exactly with the EU cookie law addressed several years ago? I know every one of my clients that runs ads had to put a little pop up on their site stating that tracking cookies were in use. Their ad networks made them do it. So, if you run ads, go have a look at this article and see if you think your cookie law plugin is indeed what is making you compliant. Got some old blog posts gems that aren’t getting the attention they deserve anymore? Maybe you should consider republishing them. Here’s a super guide from Darren Rowse, aka the Pro Blogger, on the best way to do that. And if you follow this advice, Google will be happy with the way you do it too. Now, keep in mind that changing the publish date is going to make that post pop back up to the top of your blog. And if you show those on your home page or category pages, it will come to the top of them as well, just as if you had published a new post. And, it will go out on your RSS to email feed if you use that too. So, you may not want to do this for any post that is less than a year old, as your current followers and subscribers will likely remember the original. Republishing older content is just one of the topics I covered in my interview with super SEO consultant Brian Weiss earlier this year. We also covered all of the fundamentals that 80% of my clients were missing when they first came to my DIY SEO course too. So, definitely have a listen to that interview to learn new SEO tips and bust some old SEO myths too. Great post as always, MaAnna. Thanks so much for the link to Darren’s post on republishing old content. I’ve been doing this on a regular basis for three years and Darren’s post confirmed that I’ve been doing it correctly. What a big relief! Now that there is no Google penalty for trying to cheat the freshness algorithm, I need to create a schedule for updating and republishing my older content too. Most of it is not evergreen, but a little updating is a good thing for using this method anyway. One tactic that I’ve found useful is to identify posts with outdated content in that are no longer receiving much search traffic and substitute entirely new content that’s currently relevant and matches the original post’s title and URL. I never tweak the URL but I will tweak the title a bit if I need to. I’ve been doing that for well over a year and it’s really helped increase my blog’s traffic over time. There doesn’t seem to be any type of search engine penalty for doing that because I have posts that started receiving extra search traffic the same day that are still doing well a year later. Yep, leave that URL alone!! And glad to know that changing out the whole content is working. I know some of this goes over folk’s heads, but if you go through a site audit and then listen for a while, all of it starts clicking! !